In celebration of the 75th anniversary of the beloved film The Wizard of Oz, novelist Cindy Thomson has written an essay on the personal history and literary life of L. Frank Baum, the creative mind behind the original story. 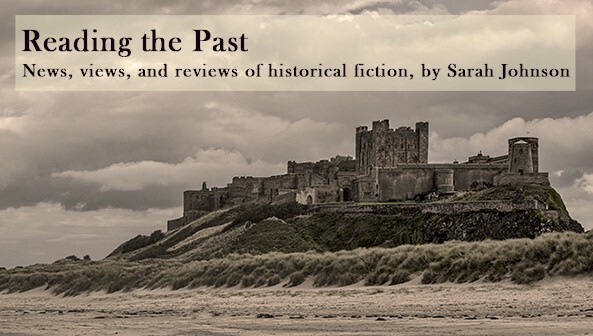 I'll be posting an interview with Cindy about her new historical novel Annie's Stories shortly. This year marks the 75th anniversary of The Wizard of Oz movie starring Judy Garland. Decades earlier, Lyman Frank Baum had written the endearing fairy tale, The Wonderful Wizard of Oz, which has continually enthralled audiences for over a hundred years. Certainly the 1939 movie starring Judy Garland has contributed to that, but as early as 1902, stage productions took up the tale. When Baum wrote the story, did he see it acted out in his head? When you look at Baum’s life, that seems likely. Baum, who preferred to be called by his middle name, Frank, was born in Chittenango, New York on May 15, 1856. His father made money in the oil business and built the country home where he raised his family. Frank enjoyed a pleasant, comfortable childhood exploring the acres on his family’s estate and reading at leisure. He spent time alone, having been born with a heart condition that did not allow him to engage in rough childhood games. He has been described as a dreamer, and it’s likely his fertile imagination was nurtured from an early age. When he was fifteen Frank published a newspaper with his brother Harry. While it was not professional, it did allow Frank to develop his writing skills. He would later publish another monthly paper with a friend. Baum worked in many occupations before becoming a children’s novelist in his 40s. Baum’s father owned several theaters and his sister, Frank’s aunt, was an actress. This no doubt encouraged Frank to try his hand at acting as well. He toured the state with Shakespearean troupes. He went on to appear in some productions at the Union Street Theater in New York City. Later he would manage some of his father’s theaters, and even produce his own stage play, The Maid of Arran, which saw success and was performed as far west as Kansas. But he had no other successful productions until 1902, when the first stage performance of The Wizard of Oz met audiences. Baum met his future wife, Maud Gage, in his home state. She was the daughter of the famous suffragette Matilda Joslyn Gage. Maud, having been influenced by her mother, was straightforward and pragmatic, which was helpful in balancing out Baum’s dreamy and somewhat carefree personality. The theater was not enough to support a family, so Baum went back to working in his father’s business. When his father passed away and the business failed, Baum took his family west where he opened a store and took up the creative outlet of photography. He also began to enthrall children, both his and others, with his storytelling. Eventually he would run another newspaper, entertaining folks with even more fictional stories. But as would happen with most of Baum’s ventures, this one eventually failed, perhaps due to drought conditions and Indian wars. After his fourth son was born Baum moved the family to Chicago, where he worked as a reporter on the Evening Post. He would take on a few other jobs, one of which required frequent travel. When he was home with his boys, he liked to tell them stories or read them books. With the advice of his mother-in-law, Baum wrote down his tales. His connections in Chicago publishing proved beneficial in getting his stories published. His first children’s book, Mother Goose in Prose, did fairly well, and the publisher Way & Williams planned to publish another Baum book. However, they went under before that could happen. With a weak heart to contend with, Baum gave up the life of a traveling salesman. He founded a trade periodical for window trimmers. At the Chicago Press Club, Baum met illustrator William Wallace Denslow. The two men teamed up and had the George M. Hill Company, at the time more of a printer than a publisher, publish their creation Father Goose, His Book. The printer shared the cost with Baum and Denslow. The book was an immediate success, selling out several printings and becoming the best selling children’s book in 1899. Baum and Denslow presented Hill with a manuscript titled "The Emerald City." Hill did not like the title, but offered a deal that this time included all the costs paid by the publisher. Once Father Goose took off, Hill was willing to publish whatever Baum gave him. 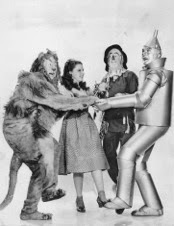 The title “From Kansas to Fairyland” was suggested, then “The Fairyland of Oz,” and then “The Land of Oz.” Baum was not satisfied and just before going to press he settled on "The Wonderful Wizard of Oz." The book became a best seller the Christmas of 1900. Hill published close to 90,000 copies. The colorful illustrations were a major part of the appeal. Critics raved about it, correctly predicting that adults would enjoy it as much as children. Baum would go on to write several more books, including a whole Oz series, but all most people remember is The Wonderful Wizard of Oz. 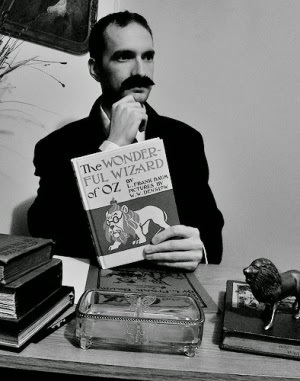 While there were a few attempts by other American writers at the time to produce an original fairytale, Baum’s The Wonderful Wizard of Oz was the first to succeed, and perhaps it was Baum’s dreamy imagination, his experience with theater, his love of children’s stories that all came together to make it happen. 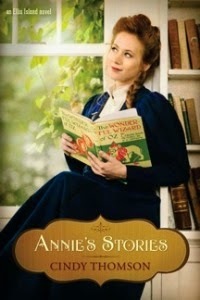 Cindy Thomson’s newest novel, Annie’s Stories (Tyndale House Publishers, July 2014), features a character reading the “new” book The Wonderful Wizard of Oz. The book appears prominently on the cover. Thomson’s Ellis Island Series contains the struggles and perils early 20th-century immigrants overcame to live in a new country. You can learn more at www.cindyswriting.com. Thanks, Cindy - glad to learn more about how "The Wonderful Wizard of Oz" came to be!! I read somewhere that his mother-in-law played a crucial role in his success? Her very existence probably made it more likely that Dorothy wouldn't be a wimp. Yes, Matilda Joslyn Gage. She was not in favor of her daughter marrying him. Wow. The Wizard of Oz isn't my favorite story or film, but this was fascinating. I loved the one in which the friends assembled chairs and feather (?) and made a flying, sentient being. However often I made concoctions of chairs and bedspreads in my room, I couldn't make them alive.